Heritage influences, drawing on the rich history of leather-working are paired with modern production techniques and premium quality leather to produce a covetable and beautiful collection which is both astonishingly practical, durable and versatile. Often used as wall, door and ceiling surfaces, headboards and cabinet detailing. Few materials provide a more discrete sense of privileged luxury. The result is a covetable and beautiful collection. An exquisite range of 26 colours. Whilst delightful they are also an astonishingly practical, durable and versatile product. Taking reference from the textiles of the arts and crafts movement. The distinctive floral design is deeply tooled into thick belting leather. 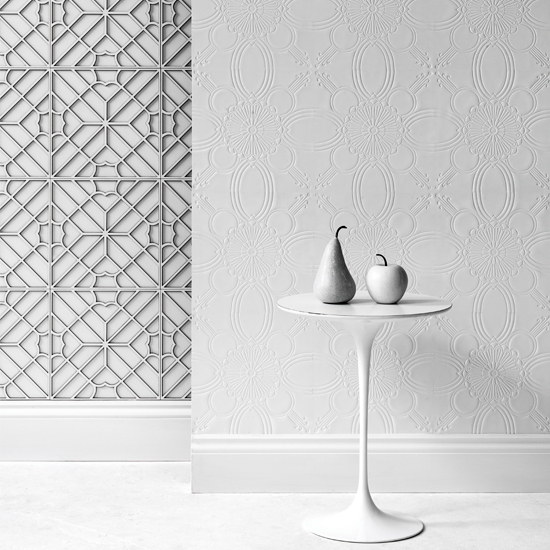 The bold pattern, deeply embossed, responds beautifully to the effect of light and angle. Traditional Asian wooden screens, with their intricate fretwork, are the source of inspiration for Maze. Distilling and evolving the complex intersecting lattice pattern. 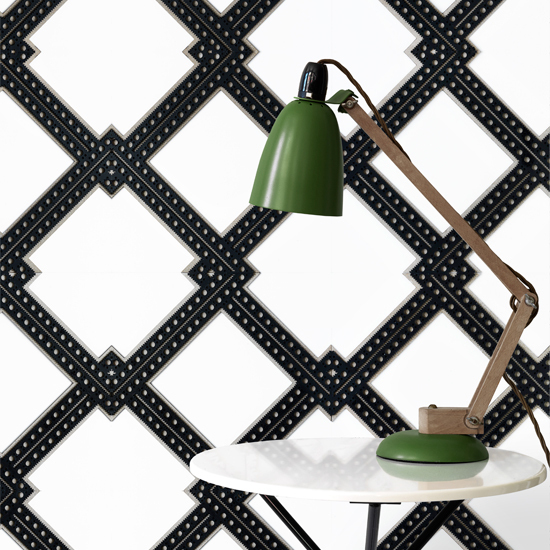 Precisely cut from two layers of leather, Maze is a subtle, contemporary yet intelligently ornate relief leather tile. Used in mono or duo colour combinations using any of the 26 colours available. The graphic power of the design means that the weight and structure of it’s composition can be adjusted and refined without compromising the visual integrity. The brogue detailing of traditional mens shoes and fieldwear is interpreted with the bold geometry of Modernism. Precision cut and formed from three layers of leather. These, depending on a client’s brief, can be in soft, muted neutrals for a subtle, tonal accent. A bolder statement can be announced, alternatively, by using high contrast vivid colours. A clever and informed redux of tradition that is timeless in it’s elegance. Influenced strongly by the pattern and form of traditional marquetry and parquet woodworking. 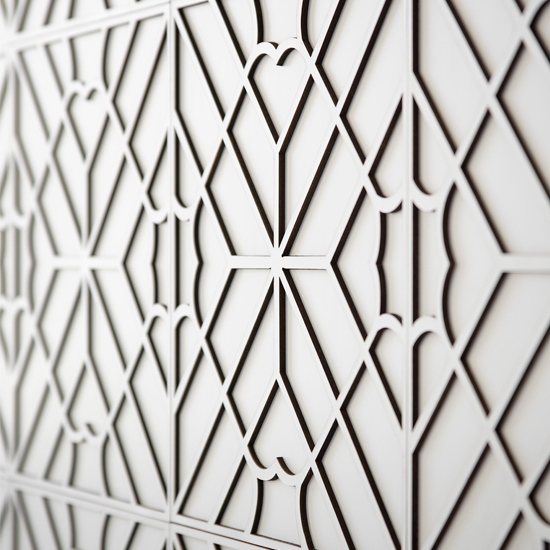 Facet is a leather tile using four subtly different shades of belting leather. Precisely cut and meticulously inlaid. 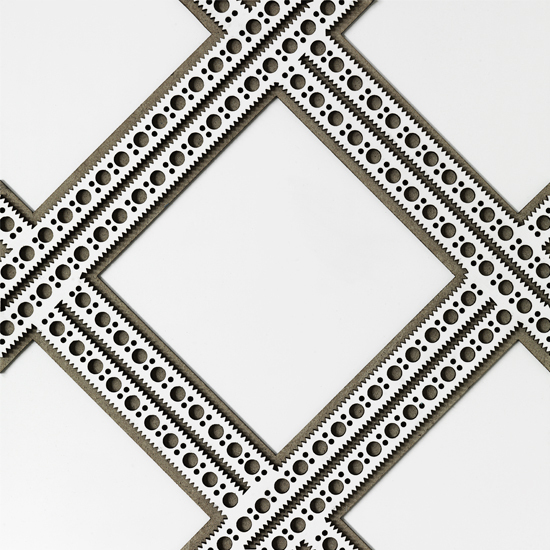 Facet creates a stunning and intriguingly elegant graphic statement. 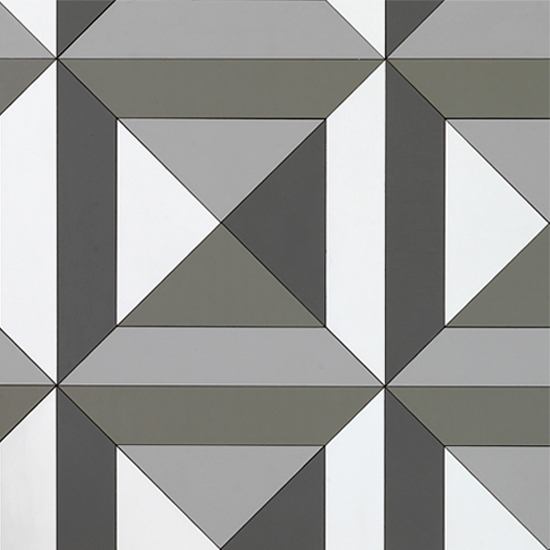 Facet has been used to dramatic effect as wall panelling in hallways, bar fronts, and facades on bespoke joinery. A bold contemporary statement in luxury materials. Genevieve’s long fascination with Art Deco wrought iron railings is clearly revealed. The pattern, though fundamentally geometric and repeating in its nature, has a softness and gentle flow to it through the use of curved lines of varied thicknesses, decorative dot detailing and the simple stylized floral motif. 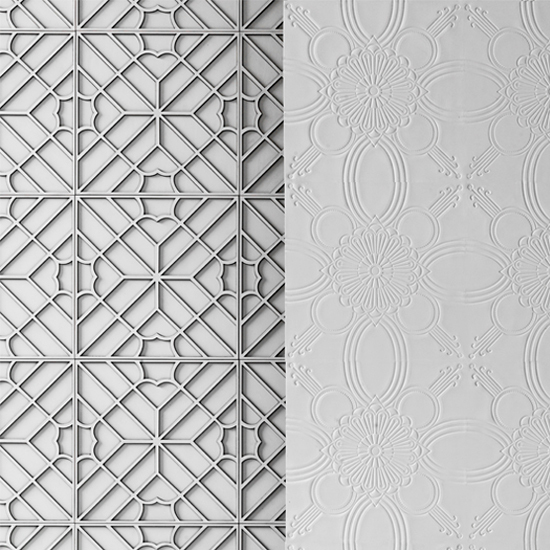 The pattern is embossed into thick leather creating a richly textured and luxurious wall covering. 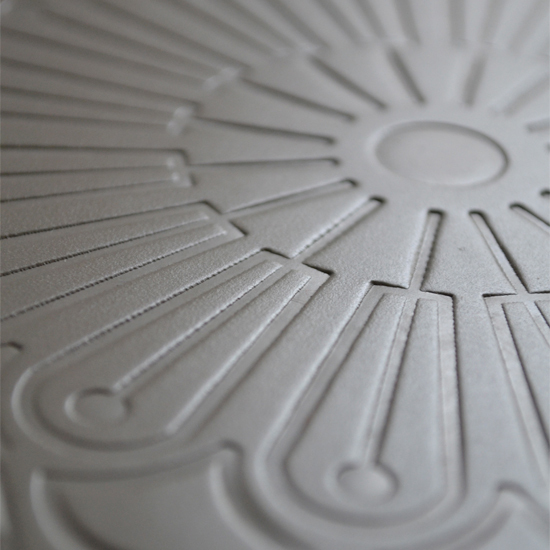 The design can also be engraved into the leather for a cleanly defined graphic effect. The colour, and contrast, of the engraved line varies depending on the leather colour selected. 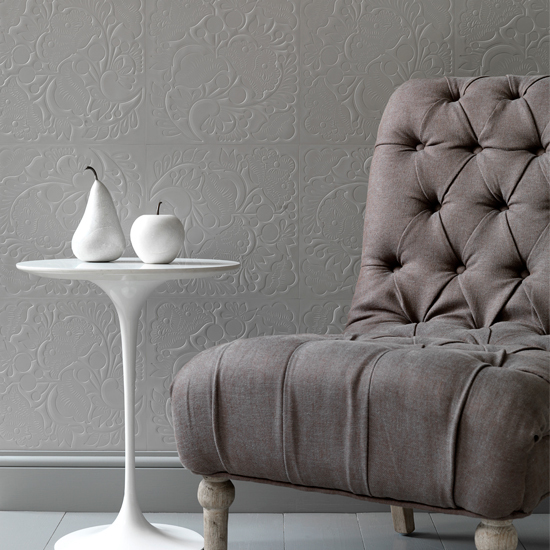 Light coloured leathers reveal a bolder definition whilst darker leathers produce a more subtle tonal statement. 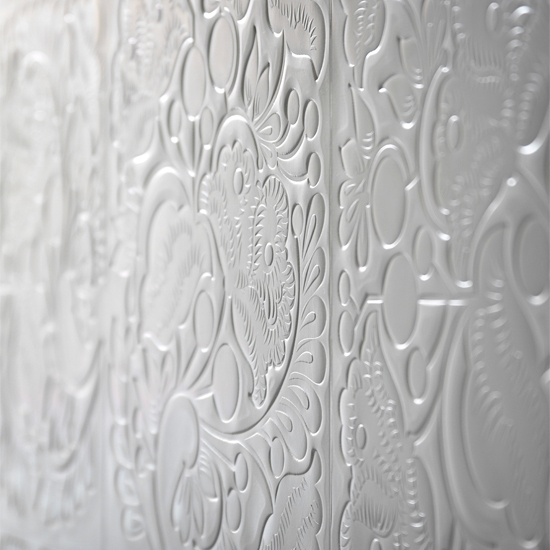 Starflower engraved can be used as a surface detail for furniture, walls, bar fronts and doors. A quiet gesture of luxury for both commercial and residential spaces.